A Hot Mess, the Tastebud Guides free eBook guide to Poutine in Victoria launched today! Here is an excerpt to whet your tastebuds (pun sort of intended...). L’Authentique Poutine & Burgers is a recent edition to the food truck scene that is starting to emerge in the Greater Victoria region. 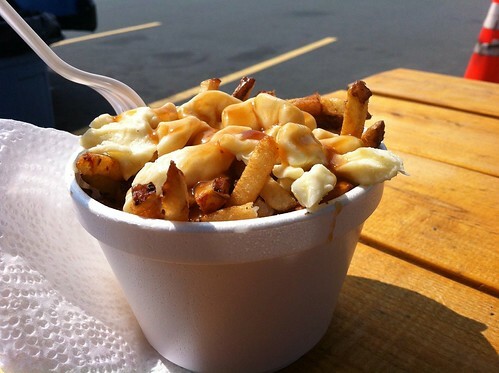 Owner Sébastien grew up in Warwick, QC, one of the rural towns where poutine is said to have originated. His family owned poutine shacks growing up and he worked in the famous cheese factory that reportedly inspired the dish way back when throughout his teens. Now serving up traditional French Canadian cuisine in Victoria, his truck has quickly gained a following from ex-pat Quebeçois and Anglo poutine lovers alike. Unfortunately, the original cart met a sad and fiery end in the parking lot of the Langford Canadian Tire in August, just a few short months after opening for business. Like true Quebeckers the owners have come back from the dead, planning to reopen their hatches in October 2012. Stay abreast of their latest updates and location by following them on social media. The poutine was served in a very traditional styrofoam takeout container and topped with a thin, piping-hot and lightly-seasoned veloute sauce. The cheese curds are fresh were perfectly squeaky in your teeth, and the thin fries soaked up ample amounts of sauce. This poutine perfectly matches the description of a traditional rural Quebec poutine, but given Sébastien’s origins, this is no surprise. If you are craving something less traditional, they also have a poutine of the day where they get quite creative. For example: La Québeçoise! contained “Maple sirup hot dog sausage with sautée oignon and bacon bit.” For something between completely creative and plain poutine there is also the option to add Montreal smoked meat on top.